One of the joys of the Scandinavian Film Festival Los Angeles is the chance to follow the evolving career of an extraordinary and prolific talent from one “Nordic” season to the next right in Beverly Hills. At the Writers Guild Theater (135 South Doheny) on January 12th, 13th, 19th, and 20th, the festival, now in its 14th year, will showcase 25 films, theatrical and documentary features as well as shorts from the region, many of them both international prize winners and awards contenders in Hollywood. Audiences will surely remember the thrill of Baltasar Kormákur’s offbeat detective mystery, Jar City (2006), that had them laughing when they wanted to be cringing all the while they were unexpectedly informed about shards of Iceland’s culture. His talent fills the screen again this year, when he is bigger than ever in world cinema. I had a chance to talk with him during his visit to the Los Angeles County Museum of Art recently where he commented on his new work in a post-screening discussion. On Opening Day of the Scandinavian Film Festival Los Angeles, Saturday January 12th, local fans can see his film at 1:45 pm at the WGA Theater. Bridging the intimate with the epic in a true story that is at once a dramatic adventure and an allegory of Iceland in recent years, Baltasar Kormákur takes us to the chilling depths of the blackest of waters and skies alike. The Deep is his latest opus after seven other feature films in diverse genres, and it is his country’s submission for the Best Foreign-Language Film Award from the Academy of Motion Picture Arts and Sciences. In The Deep, Gulli, an unlikely hero (Ólafur Darri Ólafsson, in a striking resemblance to his real-life counterpart, as the end credits of the film reveal), ponders a host of existential questions as he fights for survival after the wreck of his crew’s fishing boat that we see in underwater footage. 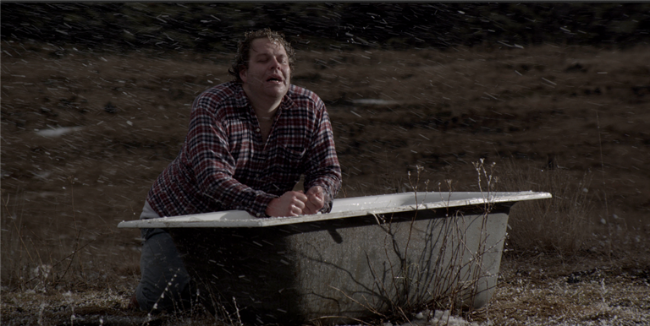 Thereafter much of the screen is filled with darkness, except for the light of Gulli’s inner faith as he reminisces, proclaims his misgivings, prays, and hopes all the while he forges ahead through the midnight sea like some kind of human whale. “We live by the sea, and we’re about the sea. I used to swim with my mom, and sail a bit, and the water comes right up to our house sometimes, so it’s part of us, and that’s why it absolutely had to be shot on location, in the North Atlantic Sea. The color, the darkness of the water — anyone who makes films knows that water’s one of the hardest things to get right,” comments the writer-director, having made The Deep in-between American ventures but also as another installment in his films of the sea. 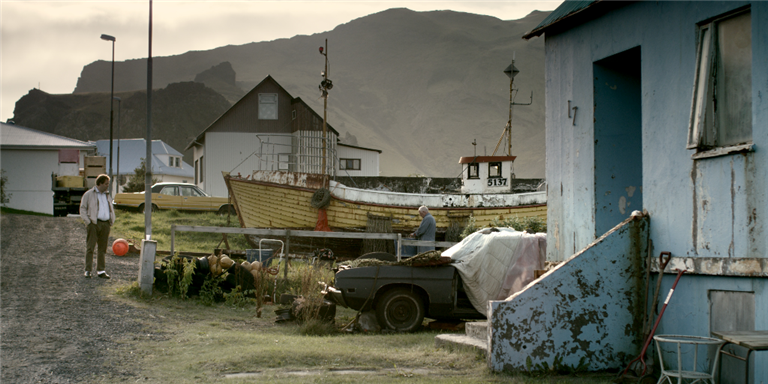 Director: Baltasar Kormákur; Producers: Baltasar Kormákur, Agnes Johansen; Screenplay: Jón Atli Jónasson, Baltasar Kormákur, based on the play by Jón Atli Jónasson; Cinematographer: Bergsteinn Björgúlfsson; Editors: Sverrir Kristjánsson, Elísabet Ronaldsdóttir; Production Designer: Atli Geir Grétarsson; Music: Ben Frost, Daníel Bjarnason; Sound Design: Kjartan Kjartansson, Ingvar Lundberg. Cast: Ólafur Darri Ólafsson, Jóhann G. Jóhannsson, Björn Thors, Thröstur Leó Gunnarsson, Thorbjörg Helga Thorgistsdóttir, Walter Geir Grímsson, Stefán Hallur Stefánsson. Theódór Júlíusson. Color, DCP, 93 min. In Icelandic with English subtitles.